“Schau her, schlecht Weib, wie oft du betrogst mit gepantschtem Bier die Leute. (Look here, you bad woman, how often did you cheat people with watered down beer. (A follower of the prophet, he offered beer to the faithful. 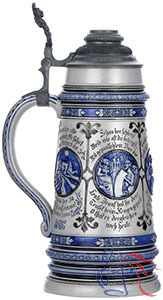 “Die alten Deutschen opfern hier ihrem Götzen Bier. (The old Germans are here offering beer to their idol. 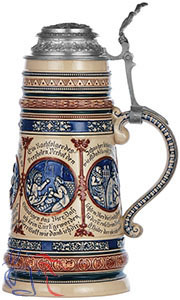 The allegorical pictures and inscriptions on this stein (see details, bottom row) are taken from wall paintings in the Munich Ratskeller.